Black and Blue: The Unofficial Lincoln Stars Blog: Congrats to Ryan Jones! Per his Twitter account, Lincoln Stars defenseman Ryan Jones ('96) has committed to play college hockey for the University of Nebraska-Omaha. Click here to read the official announcement from the USHL website. The University of Nebraska-Omaha is located in Omaha, NE (shocker), and they play in the National Collegiate Hockey Conference (NCHC). Ryan was originally selected by the Lincoln Stars in the 14th round of the 2014 USHL Entry Draft. In 27 games for the Stars this season, Jones has accumulated 5 points (1g, 4a) along with 26 penalty minutes. Four of the five points Ryan has so far this season have come on the powerplay. 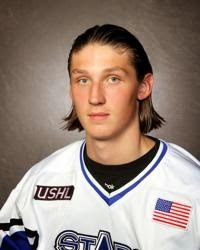 To be a rookie defenseman in the USHL is not easy. In my opinion, it's the hardest position to play as a rookie in this league. Things happen so fast, and it's so physical. The fact that Ryan has played extensive minutes for the Stars in EVERY game so far this season speaks to the talent he has. I've read some tweets that indicate Ryan will start his college career at UNO in 2016, so that means he'll play one more season in Lincoln, which is a good thing. Congrats again to Ryan! Very happy for him and his family. I had an opportunity to talk with Ryan's dad at Lincoln's tryout camp this past June, so I'm sure he's a proud papa right now.